The album of 'Agnyaathavaasi' features lyrics by Srimani and Sirivennela Sitarama Sastry. Anirudh Ravichander, Nakash Aziz, Arjun Chandy, Vishal Dadlani and Niranjana Ramanan are the singers. As a debutante, Anirudh has made immense efforts to make the album sound as native as possible. And he succeeds in that. The number has all the trappings of a thrumming, energy-pumped, hero-centric song that brims with rage. Vishal Dadlani and Anirudh's vocals size up the colossal intensity of the lyrics. This must be Srimani's one of the most important songs with high-sounding phrases and language. Musically, guitar, bass and tabla go a long way in making it a mix of both class and mass. The song might not lend enough to dance moves, but it can herald a build-up to an engaging, self-absorbed episode. 'Baitikochi Chuste' can give you a romantic high with its allusions to everything from a villainous 'gali' to coffee and more. Lyricist Sree Mani chips in with one too many English words and that's how a sense of zeitgeist is writ large on the number. Sample these: 'Corner lo coffee shop vedi vedi ga whistle ese', 'jarinde nelapai needala', 'Nuvvunna kitiki ae vaipo vethiki WhatsApp chestava', among others, are evocative while being in the everyday language. The acoustics are largely in the mould of Anirudh's songs. The guitar gives many reasons to root for the sound. The use of the piano is lyrical. Kamlakhar's flute midway through the song is a spectacular innovation. Rendered to a lively effect by Anirudh himself, the song is a whiff of fresh air for those who are not used to the music director's songs. The devotional song was originally composed by Oothukkadu Venkatasubbaiyer and so, Anirudh gets credits for arranging the number. Keba Jeremiah's Acoustic, Electric & Bass Guitars are nimble. The orchestra is absorbing. Niranjana Ramanan's vocals are dazzling and evoke devotion. Since the teaser features the number throughout, her vocals have already become quite familiar. Rendered to a scintillating effect by Anirudh Ravichander, 'Gaali Vaaluga' is also a throwback to the classical Western style at one level. In this boisterous set-up that the music director is known for, he makes a syncopated pitch in his own right. Ramajogayya Sastry's lyrics poetically capture the lover boy's longing for his muse's friendship. 'Cheli ila dorikithe nee sneham' and the like size the feelings up. Curiously, such contrasting words as 'Manohari' and 'Pisachi' have been deployed to describe the beautiful girl, who may well be trolling the hero with her obstinacy. Music-wise, the instrumentation gives enough room for the choreographer to mount a song that has the bare minimum yet graceful dance moves. The trademark instrumentation of the Anirudh variety is ubiquitous. One is also reminded of a song from 'Remo' here and there. Nakash Aziz and Arjun Chandy with their sharp vocals make this a focused number that is instantly appealing. Srimani's lyrics are once again distinct, featuring creative phrases and even some crazy thoughts. A lively, peppy and sprightly album with all the features of a classy ensemble. 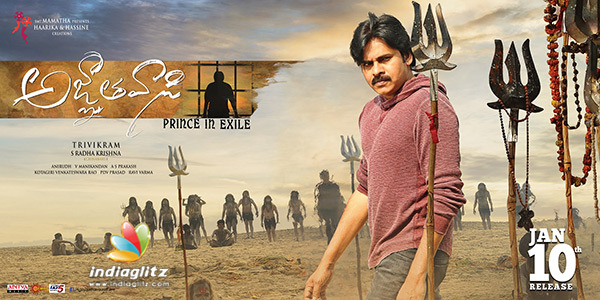 Hard to come by any typical mass masala number, true to Trivikram's style. Anirudh clearly makes an entry with a bang.